So, last month was Train Your Dog month, and now we’re looking at February, which is Pet Dental Health month! 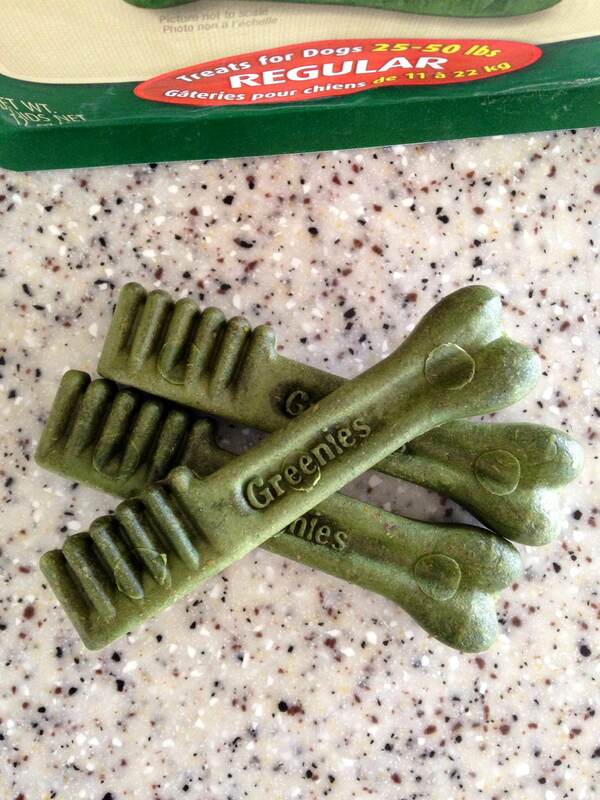 That said, in honor of Pet Dental Health month, we got the chance to review Greenies! Perhaps surprisingly, Pyrrha has never had Greenies before, so we were happy to try them. 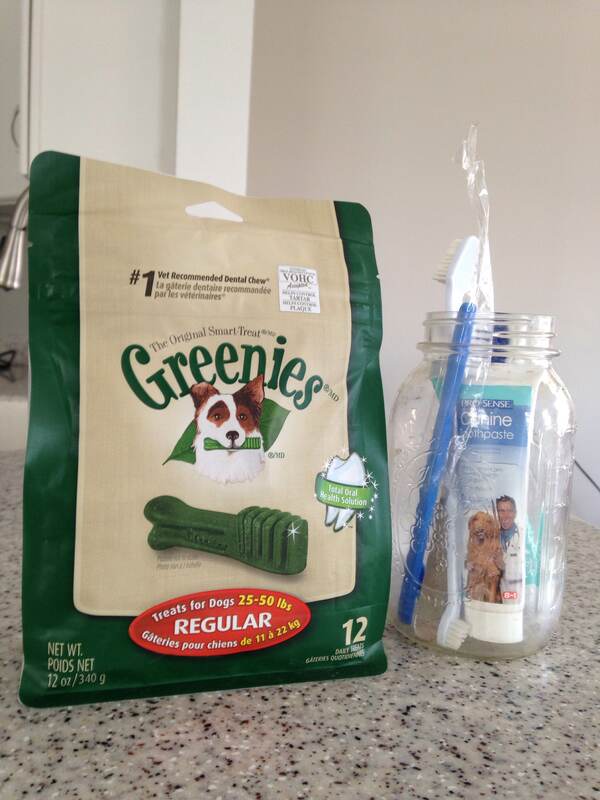 Bag of Greenies with our dog teeth-cleaning supplies. 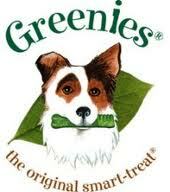 Greenies are a fairly well-known brand, produced through The Nutro Company. They have a wide variety of oral health treats and products. 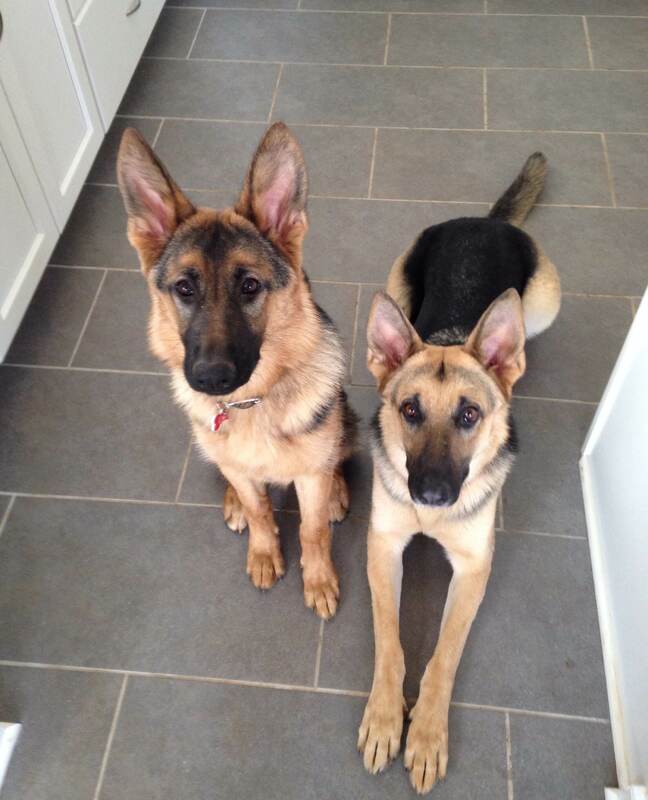 We received a bag of 12 chews in the regular size (advertised for dogs who are 25-50 lbs. ), which are on sale for $11.21 at Chewy. The girls, as you can see, were very eager to try them! I gave them each one chew as a reward for politely entering their crates (we’re still teaching Eden the command “go to your house,” which is a traditional command from Guion’s family for dogs to go to their beds). They got through them pretty quickly, but that’s standard for these shepherd gnawers. In an independent 28-day feeding study, dogs receiving one GREENIES® Dental Chew per day averaged 60% less tartar accumulation, 33% less plaque accumulation, 80% healthier gums and 45% improvement in oral malodor (halitosis) compared to dogs who only received dry dog food. I’m interested to see how these chews help the dog’s teeth, particularly in conjunction with our regular brushing. Do you brush your dog’s teeth? Or do you give them Greenies or other dental chews? If so, what tips and tricks have you learned along the way? Disclaimer: We were provided with a bag of Greenies from Chewy.com in exchange for our honest review. Perfect timing. I made exactly the same resolution today as I shamefully brushed tala’s teeth for the first time in the new year…. Our fought and fought so now we give a specific type of chewy called Dentastrix and voila, no build-up. I brush our dogs teeth every week. It is not easy to do as they fuss, but they do like the flavor of the toothpaste and like licking it off the brush! They get Greenies too. I also tend not to brush my dogs’ teeth as often as I should. They are happy chewers though, and keep their teeth fairly clean with antlers and Himalayan chews. I’m trying to be better about brushing this year also! My first dog loved Greenies, but my vet recommended not to give them, because they’ve done a number of surgical removals of the bones at their practice. (Apparently many dogs don’t chew them slowly and thoroughly enough, and they don’t digest particularly well.) I have subsequently met several dogs who have had digestive problems (including surgical removal for a few due to blockages) and no longer feel safe giving them to my dogs. I know many dogs chew Greenies daily and are fine, but I don’t want to take the chance, especially when I have alternatives. I do like their pill pockets though! Same here, Steph. I’d heard from our vet and other dog owners about how dog had gone to the vet because of blockages. That scared me away from Greenies. Dixie gets antlers instead, and alas, I too am one of those who don’t brush her teeth as often as I should! I get good about it and then I get terrible! Thanks for the reminder! I don’t brush my dogs teeth. I feed the raw diet and it really does keep their teeth clean. My 9-year-old doberman used to have really bad teeth (like dark brown/black molars) and after switching to raw and eating a few months of itthey are now almost perfectly clean again. I don’t think they will ever go back to pristine 🙂 lol, but he doesn’t need a dental anymore! I brush my dog’s teeth every night. I think it is hard to keep to a schedule of ‘several times a week’ because it is so easy to forget how many nights have passed since a brushing. Daisy gets her teeth brushed every night before I do mine – so it’s easier to fall into a routine. I also recommend a triple-headed brush which comfortable fits over the row of teeth and then cleans the sides at the same time as the top of the teeth. It makes brushing much easier and less likely to poke the dog in the mouth when/if they squirm around. Finally, please check the labels on your dog toothpaste and ensure you are using one that is Made in USA. There are some toothpastes coming out of China. Brush Silas’s teeth. HAHAHAHAHAHA. I’m doing good when I trim his nails more than once a month (which he needs, because he doesn’t walk on sidewalks.) He also can’t eat most chewable dental treats, thanks to his allergies. We do feed raw. (Lew Olson’s book Raw and Natural Nutrition for Dog and Mary Straus’s website dogaware.com are the only two resources I trust completely for raw food info, by the way. Feel free to e-mail if you want to chat about it.) At 2.5, Silas has a few visible, but not bad, plaque spots, mostly inside his upper front teeth. I’m assuming this is an effect of how he chews. He also mooches a lot of sugary human food, which probably doesn’t help. Otherwise his teeth are beautiful. I have never brushed my dogs’ teeth. Feeding raw has eliminated the need for it. I have fed Greenies and Zuke’s dental treats on occasion. I’m not sure if anyone else has mentioned it, but I work for a specialty pet foods store, and we sell out of the InClover brand of dental chews on a regular basis. The IC company is an amazing one… seriously, check them out! The chews have tons of health benefits, above and beyond dental health.